I thought we would have some fun and head out to another area of North Charlotte called Mooresville. I love main street Mooresville, with the antique shops, ice cream shops and diners, it takes me back to a different time. Love the old fashioned feel. We also had the best luck for this photo shoot for Karina Dresses. I had to “come back to reality” as it is 90 degrees, very sunny and we are in the South, so those accessories will just have to wait. I did keep it simple, as I don’t like to wear a lot of jewelry in the summer, particularly heavier necklaces. 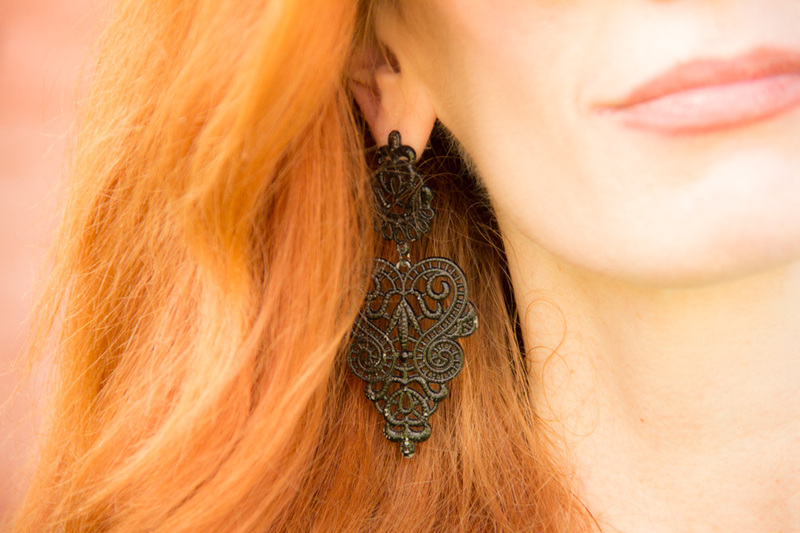 I chose instead one of my favorite pairs of vintage filigree earrings and a fun blue grey flower brooch. Pearls would have looked lovely here too to add some elegance and break up the darker colors. I loved the teal blue color of this dress, The Katharine, in Taos Teal, with a higher neckline and 3/4 length sleeve would take me into Fall as well. As always, Karina Dresses are made in the USA and don’t wrinkle! This new collection is called the Western Wandering Collection, with new prints and cuts. Still great for packing for a vacation, day wear or professional attire. I would have loved to have known Karina Dresses when I was a teacher! No ironing in the morning! They are celebrating their 10 year anniversary, HAPPY Anniversary Karina Dresses! 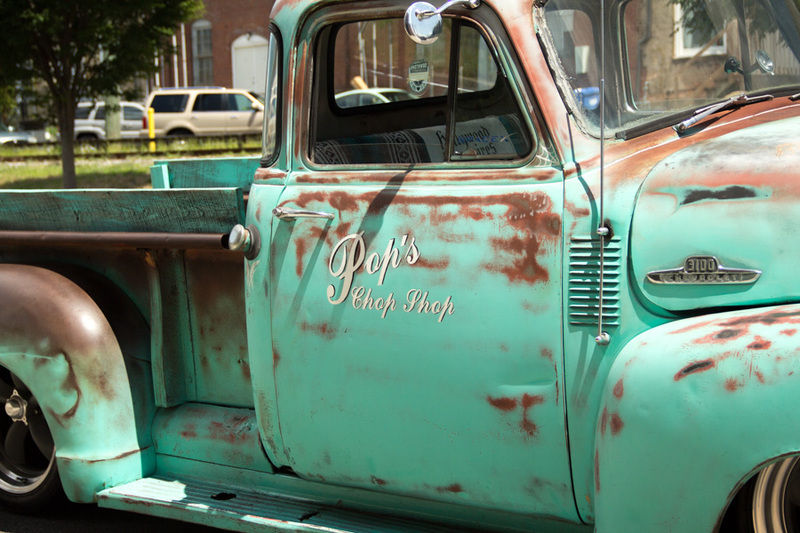 When we arrived in Mooresville, I spotted this vintage truck, a peeling sea blue with rust interspersed, and some cool writing on the side that read “Pop’s Chop Shop.” I thought perhaps we would sneak in a few pictures as it was parked outside a woodworking store. To my luck and surprise, the co-owner of the store, Tim, came out to tell me that I could use the truck in photos, and I was to feel free to sit in it as well. He was very nice and accommodating. After the shoot, I went into the shop to thank him, and met Betty, another lady who works at the shop. They sell wonderful pieces of woodworking, can refurbish pieces, and looking around I was quite taken with this charming country-style white swing with an arbor. We got a bit of the tour of the shop, and then Tim proceeded to show us to the backroom, where many scenes of Cinemax’s Banshee had been filmed. 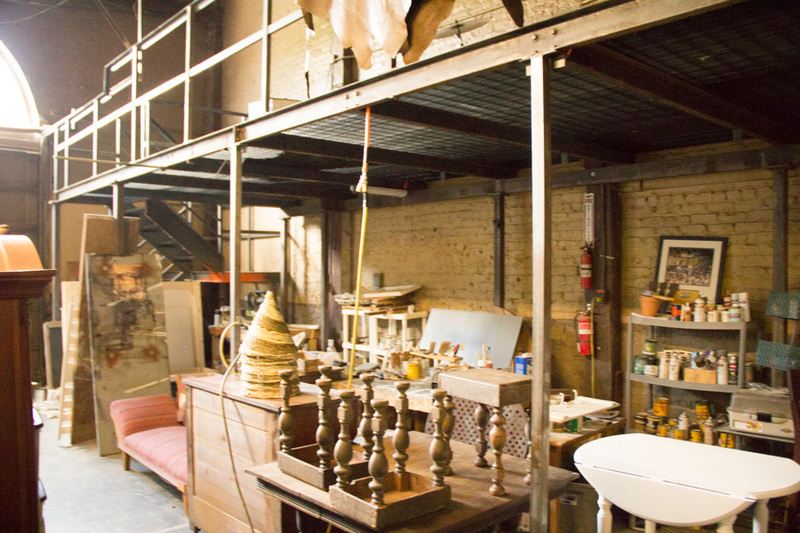 The back corner, which was filled with pieces of wood and furniture, had become the prison cell predominant in the show. 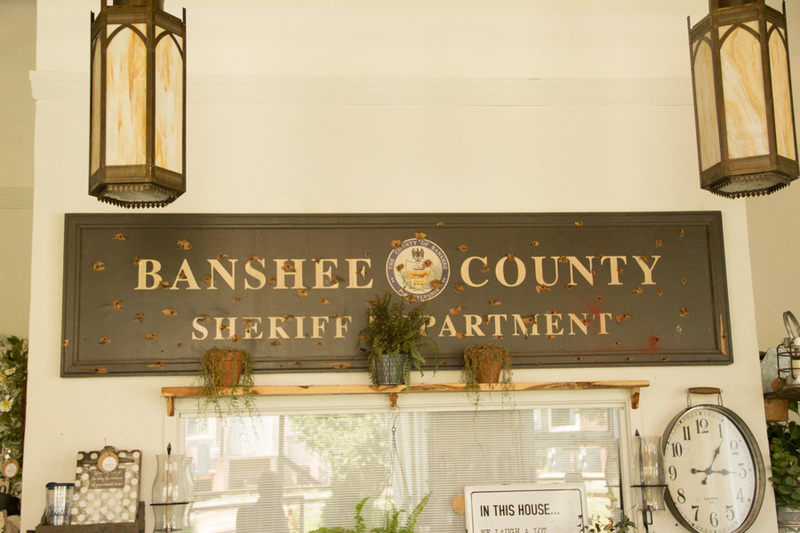 People had come into the store at some time, and wanted to by the “Banshee” sign riddled with bullet holes, as part of the show’s props… but they aren’t selling. I haven’t watched the show yet, but know my hubby enjoyed it. Charlotte has been host to various tv shows, including one of my favorite Homeland. After, as we often do after one of our photo shoot’s we went to Tim’s Place. ( a different Tim), a relatively new restaurant with a garden patio. I had some crisp, fruity chardonnay and a spinach, goat cheese and strawberry salad with walnuts. It was a nice way to top off the day after a very hot and bright photo shoot. As I mentioned in my post last Friday, dining al fresco is one of my favorite things to do over the summer. Inside WF Designs, a furniture restoration and design store in Mooresville. It was one of the sets for the TV show, “Banshee”. One of the co-owners, Tim, was the owner of the vintage truck in this shoot. He was very gracious. c/o The dress here was gifted to me by Karina Dresses. All thoughts are my own and truthful. I love Karina! Check out their Western Wanderings new line! Fantastic photoshoot Jess! You look stunning! The old truck is the perfect backdrop! Wow! That truck is the bomb. Love its aqua color with the distressed rust. Such a perfect back drop for showing off that fabulous Karina dress and your gorgeous hair! My grown daughter and I are natural strawberry blondes you look really good in that color.So my daughter and I are gonna buy something in this color. What a beautiful teal dress. I also love the antique truck, it is a fabulous prop and gives this photo shoot such a cool vintage vibe . The brooch is stunning too. Stay cool my friend. What a fun and interesting spot you found for your photo shoot! I really must visit South Carolina one day. Love the colour of the dress too. These are awesome photos! Love that vintage truck and how sweet of the owner to be so welcoming and accommodating! Your dress has a pretty color and nice flattering shape. I love the longer sleeves and the longer length of the skirt – this is perfect for Sunday mass or really any day! Those black shoes are beautiful and I can’t get enough of the tassel in the back! I love your photos in Mooresville. 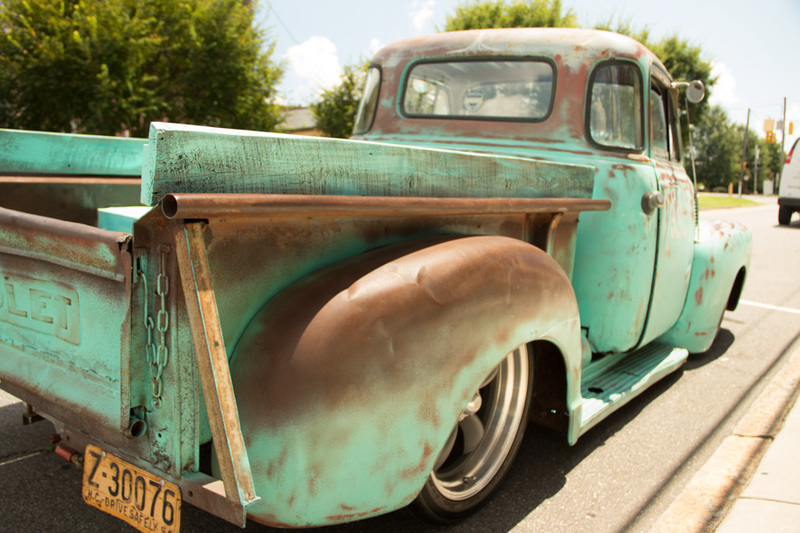 And you in that teal dress look gorgeous–especially against the old truck! Thanks for sharing and sponsoring the Link Up. I love, love, love this post. You look so classy and gorgeous…I love the feminine look of this outfit combined with the rough edges of the old truck. Beautiful, beautiful! Such fantastic photos with the old truck! I love the style of the dress and the colour is great with your red hair! Jess that dress and the color were made for you, so flattering. As always you’ve accessorized your beautiful look with just the right black touches. Kudos to your photographer, I love this photo shoot. Gorgeous dress on you and what a perfect location! The entire post has a vintage feel which I love! You look Fantastic and you picked a great spot to showcase that dress. Thanks so much for the feature and enjoy the rest of your summer. . . The color of that dress looks great on you, and with the vintage truck—what a great location to shoot in! Also, not sure if you saw, but we’re both featured this week on The Fashion Canvas’ post—yay! WOW! It’s like you were supposed to find that truck and have your pic made with it. So perfect. The dress is great and such a good cut. I have this thing for old trucks like that. We know at least one person from Mooresville, but I can’t remember who. LOL I’ll have to ask the husband, he’s better at remembering those things. What a great story too, Jess. Sounds like a fun day! How fun was this photo shoot! I love the vintage truck and learning more about Mooresville! The dress went so well with the truck, as if it was planned! I recognized those fabulous heels from Adrian Allen! Looks like you guys had a fun day! Love the photo shoot with the vintage truck – neat idea! I am LOVING these photos! That old truck really looks amazing with your dress! I really love setting of this photoshoot! What a fun post Jessica! I love your dress, even the color is so vintage. Amazing truck, how fortuitous to be able to take photos with it, they came out so fantastic! I am so jealous that you got to see where some of Banshee was filmed and it’s memorabilia, I LOVED that show! Very pretty dress with such great retro style and beautiful color! The antique truck provided the perfect backdrop. So cool to read about your impromptu tour and the small town friendliness. Gotta love it! This dress is SO good on you, babe! This dress is really pretty. You look stunning. That old car is the perfect photo background for the dress! Your clutch is adorable. When you don’t like it anymore, I want it as hand-me-down. LOL. I love this dress on you. I will have to try it next time. I adore the vintage feel of it. I also love the location you shot today. I look forward to visiting the south and finding cute little towns like that! Such a fabulous color on you, Jess! Loving the silhouette of this dress, too! So flattering! Beautiful dress and I love the antique truck as a backdrop. Beautiful dress and the color is perfect on you! I love the photos…that truck is so cool. I’ve always wanted pictures in front of a cute classic car like this one! Great find! 🙂 And love this pretty dress too. The color was made for you, Jess! What a fun photo shoot! I just love the pictures. And your dress is beautiful. I love any Karina dress I see! This truck is the perfect backdrop for photos with this adorable vintage-looking dress! That color is just gorgeous on you! I love the little tassel on the back of your heels. What a fabulous place and truck to take photos. Isn’t it so nice when people don’t mind you taking photos around their stuff?? It’s way more fun then to get to know them and become friends!! 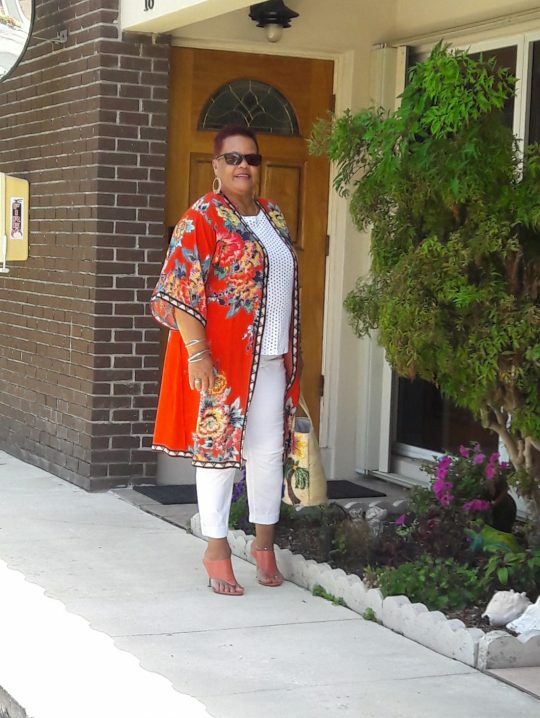 You look amazing in that color Jess….truly, that’s a keeper!! 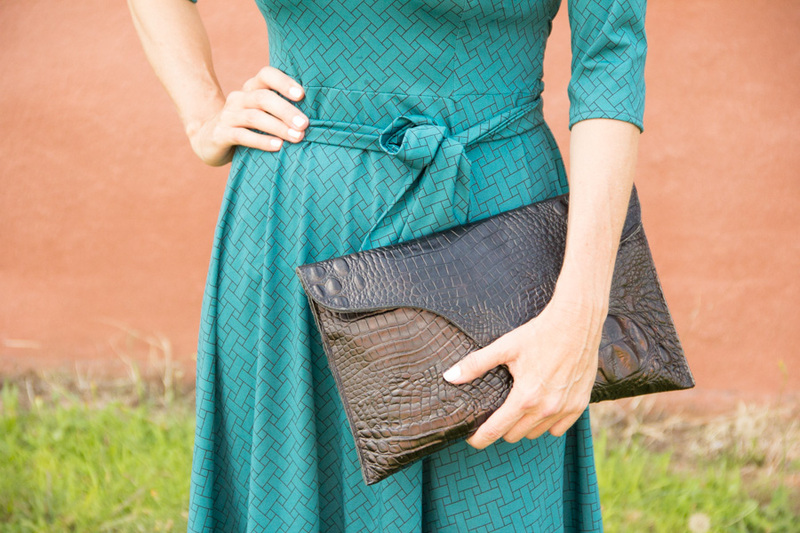 I love this shoot location–a perfect match for your teal dress! You look fabulous! Wow do I ever LOVE this photos and that dress. They could seriously be on the cover of magazine like a Vintage re-visited!! What a fun day too and that salad sounded wonderful. Dining alfresco is one of my favorite things to do too! You could find a better prop for your lovely dress Jess. This deep green colour suits you so much. Love your accessories too. That dress looks so nice on you and I love how you accessorized it with a vintage brooch. The truck makes a perfect backdrop for showing off this pretty dress. Jess, this color is so pretty on you! Red heads look so fab in green and this shade of teal is stunning on you. What a great place for a photo shoot too – that old truck could not have been better! Your lunch afterwards sounds so delicious too – I wish I was there to enjoy it with you! Okay back to the outfit – love the cut and vintage vibe of the dress, especially with the added brooch. 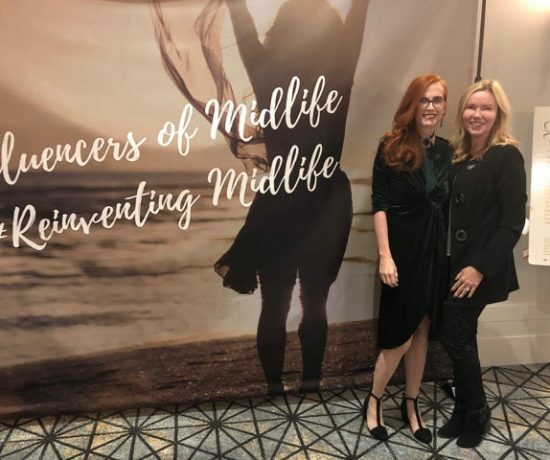 Those shoes are fab too – I love them! So beautiful Jess from head to toe! Oh my Jess, you’ve just upped the photo shoot game with these. Location, props, lighting, positioning – all pretty darn perfect! And talking of perfect … you in this dress! I love 40s style and you’ve brought it into the teensies and nailed it! Hugs, x.
I so enjoyed these photos Jess and I can see you had some fun with them. You look lovely in this dress, such a pretty colour on you. It certainly does have a vintage vibe. Many thanks for hosting. What a luck to schoot in front of this beautiful truck! Fantastic colors! And the dress is fabulous! I think Karina dresses always are!